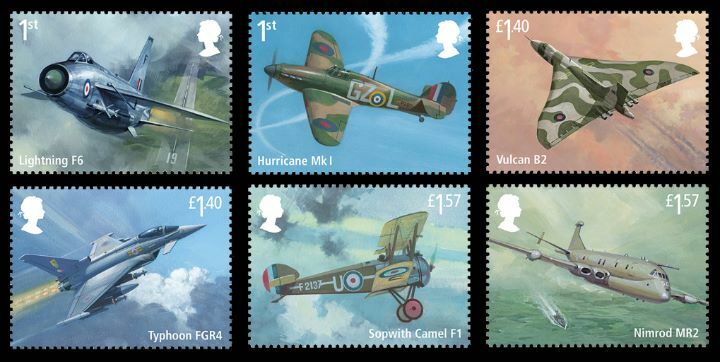 Norvic's blog has a glimpse of the 2018 stamp programme. 23 January - Game of Thrones, stamps + Post & Go. (includes an osprey, value 1st class). There are also some postal heritage stamps too. Last Edit: Aug 6, 2018 16:38:45 GMT -5 by FairyFoot: they've switched issues around since I first posted this. I find it interesting how few stamps have been issued regarding the 100th anniversary of WWI (1914-1918) compared to the 50th anniversary of WWII (1939-1945) back in the late 1980s through mid-1990s. Guess there were a lot more WWII veterans still around in the 1990s, but no more WWI veterans around now. But even in the 1960s, there were very few 50th anniversary of WWI issues. There have been quite a few sets of poppies, also there have been issues in 2014, 2015, 2016 and 2017. Check out these links on Norvic's website. I'll add GoT when I get them. I could take a picture later of the newspaper article (if I still have it) with a few stamps pictured. As noted by another member, there has been a series of issues. I have a goal of acquiring the issues of the UK and of other countries that have issued stamps that recognized the beginning and ending of WWI. That would be great as I do not have any used varieties. I did purchase the sets directly from Royal Mail. Been looking for used issues. Definitely want to be on that card list this year. I don't have full sets left, but I did have a look through my for-use stamps and I do have some WWI issues. I do my best to create used UK stamps! I started to use them. On my Instagram, posted a picture of one of the stamps next to one of the Star Wars stamps (+10p Machin). Terrific series, still as funny now as it was then. I honestly don't care much for the Game of Thrones stamps, don't watch the show. I do wish I could get my hands on more of these new issues here in the states. Yes, sorry about that, I didn't keep an eye on it - they switched issues around.